Artificial turf fields, cushioned with recycled crushed tires and increasingly in demand for U.S. athletic complexes, are getting some serious pushback. In Swampscott last week, town meeting members approved plans to install a new synthetic field with silica sand, a more expensive product touted as a nontoxic alternative to the small rubber pellets known as crumb rubber ubiquitous on thousands of synthetic fields across Massachusetts and the nation. And in Concord, more than 750 residents crowded into a heated town meeting in April to debate a two-year study and moratorium on artificial turf – a battle that crumb rubber opponents lost but left many energized and looking toward pushing for a statewide referendum. Increasingly, Bay State towns – like many places nationwide – are debating costly plans to build new, or refurbish old, artificial turf fields, and sports enthusiasts who love the vivid-green fields for their durability and easy maintenance are bracing for new opposition from parents of budding soccer, lacrosse and football players about the safety of crumb rubber pellets. The pellets, made up of pulverized tire bits and used to cushion fields and anchor synthetic grass, are known to contain possible carcinogens like arsenic, benzene and lead, according to the US Environmental Protection Agency. As opposition mounts, some consider the fields a solid waste problem, and question what towns would do with the thousands of pounds of crushed tires if the issue reaches a tipping point. The momentum of concern has pushed the California legislature to consider legislation prohibiting the use of state funds to build new fields with recycled tires and that would require towns and cities to examine cleaner alternatives before launching a new project. The Los Angeles Unified School District and the New York City Parks Departments already have stopped construction of new fields with crumb rubber following past concern about lead content. 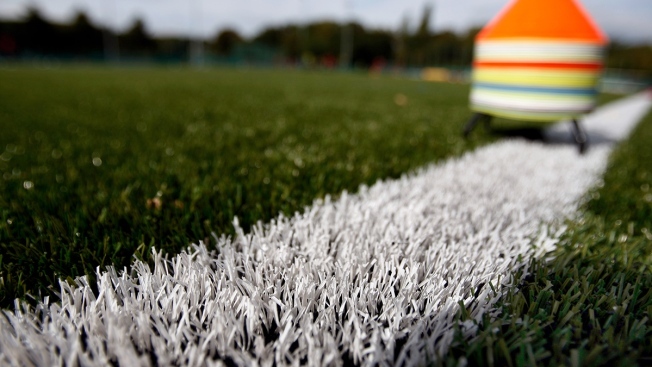 Artificial turf advocates say there are multiple studies that show fields are safe, while critics argue that there are no conclusive tests to prove such claims and that waiting for definitive evidence of a health hazard leaves children unprotected. More than 300 such fields have been built in Massachusetts during the past decade and they are becoming a coveted sports alternative for student athletes in towns from Boston to Attleboro, New Bedford to Springfield, according to a survey of field construction companies carried out by the New England Center for Investigative Reporting. Athletes who play on the fields are well acquainted with the black pellets – a spray of which is often kicked up by bouncing balls and running children, and gets into cleats and tracked into homes and mixed with laundry after practice. On a recent spring evening in Medway, a group of fourth-grade girls tested out the town’s new bright-emerald carpet, remarking about the pellets that flew in the air as they sprinted and clung to their orange socks. One pig-tailed girl said the grains were sticking to her water bottle; another admitted she accidentally swallowed a pellet. “It tastes bad,’’ she said. The state letter prompted a quick response from a Connecticut-based nonprofit pushing a national turf moratorium until more studies can be done. David Brown, director of public health toxicology for the nonprofit Environment and Human Health, Inc., warned that as more is invested in artificial fields, it will be harder for state and local officials to change their position even if new information shows harm. Concerns have simmered for years but heated up nationwide last fall with news that Amy Griffin, a University of Washington assistant women’s soccer coach, had collected a list of soccer goalies – athletes she believes get more skin contact with crumb rubber – stricken with cancer, mostly blood-related lymphomas. By late April, Griffin said her list had grown to 79 goalkeepers from across the US, plus 59 other athletes who play on turf. The synthetic turf stakes are ratcheting up because towns and public schools are embracing the fields to meet expanding demand for playing time from troops of young athletes. The number of fields has more than doubled nationwide since 2009 – from 4,500 to 11,000 – and crumb rubber is used in 98 percent of them, according to the EPA and the Georgia-based Synthetic Turf Council, an industry group. Advocates argue that turf fields are cheaper than natural options, requiring no irrigation, fertilizers or mowing. About 25,000 tires are used to create a field at a cost of $750,000 to $900,000, with about $5,000 in annual maintenance expenses, according to FieldTurf, a Montreal-based company that has built 7,000 fields in North America since the mid 1990s. Robert Pearl, Medway High School athletic director, said most of the schools in his league built synthetic fields during the past decade. Officials from three that haven’t – Millis, Norton and Sharon – have been out to visit Medway’s project, he said. Pearl echoes supporters’ views that the new fields not only are great for athletes but also a green alternative. The Synthetic Turf Council boasts that the use of crumb rubber in fields and landscaping has kept more than 105 million used tires out of landfills. “I look at it as great for the environment,” Pearl said. But others worry that the public later will regret it when its time to clean up fields, which last about eight years. “We’re postponing a huge solid waste problem,” said Kyla Bennett, regional director of the national nonprofit Public Employees for Environmental Responsibility. Indeed, considering heightened concern about crumb rubber, some municipalities like Worcester already are analyzing what to do with aging artificial turf fields. Worcester Public Schools athletic director David Shea said the city, which is just beginning to grapple with what to do with its 8-year-old field, plans to consider any new health concerns or technology before making a costly decision. “We would want to talk to all parties involved,” he said. Supporters cite studies by government groups like the Consumer Product Safety Commission and the Environmental Protection Agency to bolster assertions that the fields are safe. But five years after the CPSC’s 2008 review, entitled “CPSC Staff Finds Synthetic Turf Fields OK to Install, OK to Play On,” the federal agency posted a pink disclaimer noting the study’s limits, including its sample size and that it only analyzed lead levels. As debate intensifies, more communities are looking alternatives. Tom Younger, Swampscott town administrator, said town officials supported sand infill for their field to quell health concerns about crumb rubber. In Newburyport, officials in February also elected to use sand, which would cost hundreds of thousands of dollars more than a planned $2.2 million crumb rubber field, according to the Newburyport Parks Department. Concord resident Debbie Barr, who says she opposes the fields based on financial, health and environmental concerns, said she was heartened by the lively discussion during last month’s town meeting and hopes to harness the attention to push for a local and statewide moratorium. Jenifer McKim is a reporter at the New England Center for Investigative Reporting, and independent, nonprofit news center based at Boston University and WGBH News. She can be reached at jmckim@bu.edu. Follow her on Twitter at @jbmckim. To get more great journalism from NECIR, follow us on Twitter and Facebook, or sign up for our email list.